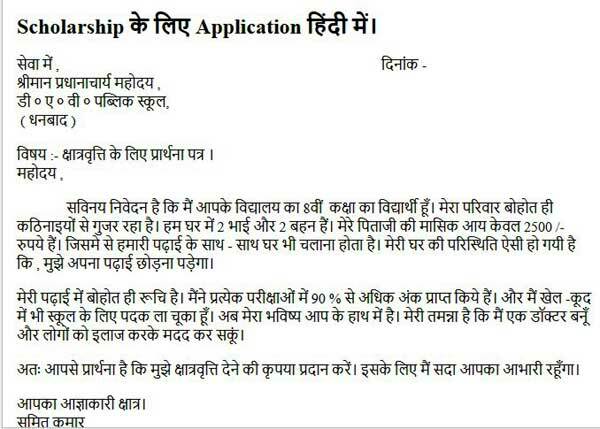 Case - 3 कोई आपको Scholarship क्यों देगा ? 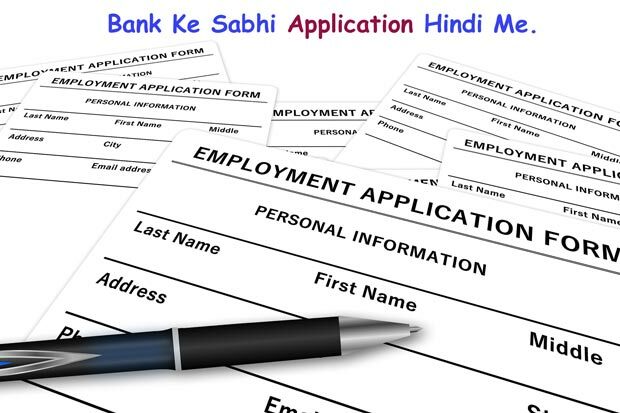 चाहे आप स्कूल में है या coaching institute के लिए apply कर रहे हैं। तो सोचिये कि कोई भी आपको scholarship क्यों देगा ? 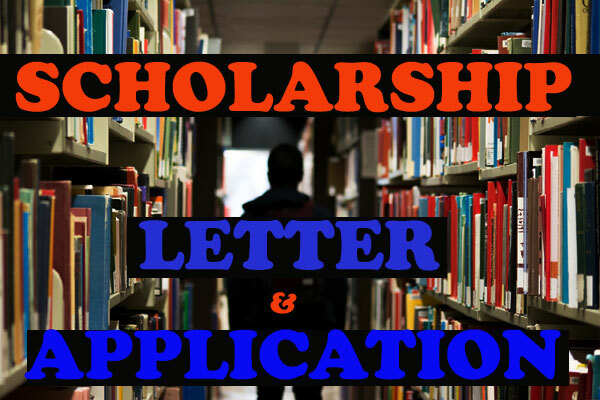 यदि स्कूल वाले सभी को scholarship देने लगे , तब तो स्कूल डूब जायेगा। आपको scholarship देने में स्कूल वालों का और coaching institute वालों का क्या फायदा होगा ? Most humbly and respectfully that, I am a class 8th student. My family is going through hard times. We are 2 brothers and 2 Sisters. My father's monthly income is only Rs. 2500/-. From which we have to run house with our studies. My family situation has become such that I have to stop my studies. I am interested very much in studies. I have scored more than 90% in every exam . And I also won many medals for school in sports. Now, My future is in your hand. My aim is to become a doctor and help people by treating them. 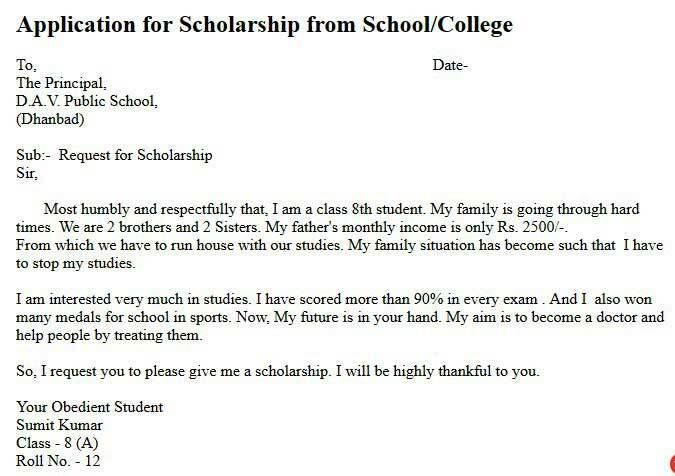 So, I request you to please give me a scholarship. I will be highly thankful to you. 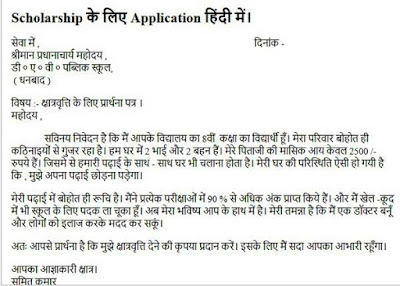 Letter - Father to Principal asking for fee concession for his son. My son Sumit Kumar is studying in class 11th in your school. He is an intelligent and diligent boy and has always shown a bright record in every examination. He passed the High School Examination in 1st division with distinction in all subjects. I am a man of the meager drawing salary of Rs. 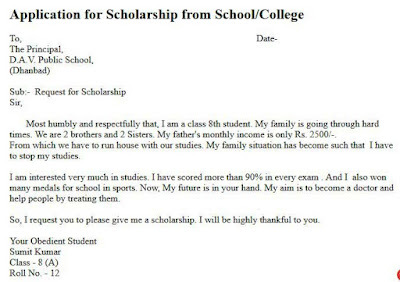 2500/- per month and having the burden of education of three other children. I find hard to meet the minimum household expenses. 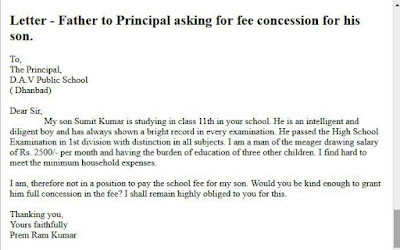 I am, therefore not in a position to pay the school fee for my son. 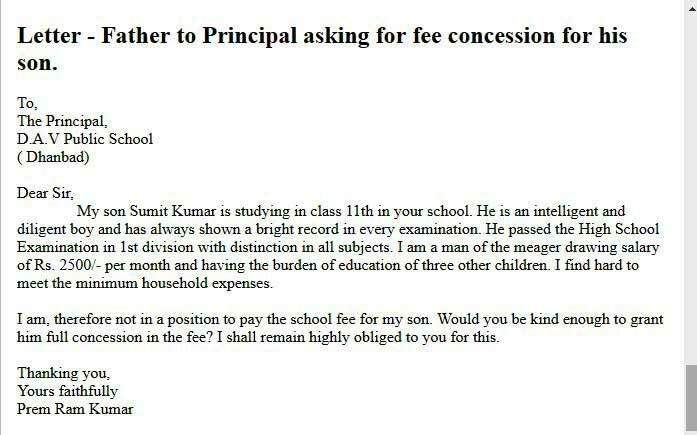 Would you be kind enough to grant him full concession in the fee? I shall remain highly obliged to you for this.